Win McNamee/Getty ImagesSen. Bernie Sanders. Sen. Bernie Sanders thinks Amazon has gotten too large. President Donald Trump has upped his criticism of Amazon in recent days. On CNN’s “State of the Union” on Sunday, the anchor Jake Tapper asked Sanders whether Amazon had gotten too big. “Yeah, I do, I do,” said Sanders, the independent senator from Vermont who ran as a Democratic presidential candidate in 2016. 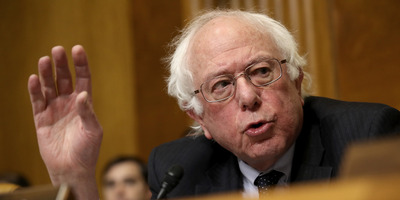 Sanders is one of a growing number of politicians who have been criticising or raising concerns about the online retail giant. His remarks are evidence of a rising tide of bipartisan anti-Amazon sentiment in Washington, DC. President Donald Trump has repeatedly gone after the company in recent days, highlighting its impact on the US’s retail sector and characterising its deal with the US Postal Service as detrimental to the agency. Trump, who has a long-running feud with Amazon CEO Jeff Bezos, has called on Amazon to pay more taxes and charged that its dealings with the USPS are a “scam.” An Amazon representative said in a statement to Bloomberg that its arrangements were “profitable” for USPS. Meanwhile, Republican Sen. Marco Rubio of Florida said on Twitter on Monday that he was concerned that Amazon’s rise could lead to “less competition” in the long run. Amazon’s becoming an online behemoth worth more than $US665 billion has coincided with a decline of the brick-and-mortar retail industry in the US. As people increasingly shop online, more than 6,400 stores closed throughout the country last year. And Amazon isn’t sitting still, continually branching out into – and potentially threatening the stalwarts in – new industries from ocean shipping to student loans. Sanders also criticised Amazon and other tech giants in an interview with The Guardian last month.